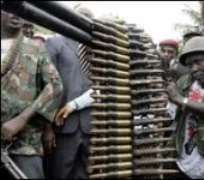 Nigeria's main armed group in the oil-rich Delta region has announced a new, indefinite ceasefire. The Movement for the Emancipation of the Niger Delta (Mend) said it had been encouraged by the government's "readiness to engage" in serious talks. Earlier this month a Mend splinter group lifted a ceasefire and threatened to resume a campaign of violence. But Mend said on Sunday a new ceasefire had been ordered to "encourage the process of dialogue". Militant groups have flourished in the delta amid a lack of governance and rule of law. They claim to be fighting to help local people benefit from the region's oil wealth, but they fund their activities with oil theft, extortion and kidnapping. Attacks on oil installations and their employees have cut Nigeria's output by a third in the past three years and helped raise oil prices.